We will be set up near the hangar next to the parking lot by the water. No entry fee due to the 10th Anniversary! Enjoy! This is an experimental event for the new Burst Classic format! As such, only parts allowed per that banlist are permitted, which are generally Single & Dual Layers. First, Second, and Third place will get their pick of one of three Beyblade Burst Turbo Slingshock Single Packs. Sorry to hear that, man. I hope you can make it to the next one! I will be coming from Waco TX. I’m bring two on my sons and a couple friends. Should we register now or the day of? (Jan. 30, 2019 9:44 PM)254beymom Wrote: I will be coming from Waco TX. I’m bring two of my sons and a couple friends. Should we register now or the day of? Everyone who is participating in the tournament should probably make an account on WBO and pre-register ahead of time. (Jan. 30, 2019 9:44 PM)254beymom Wrote: I will be coming from Waco TX. I’m bring two on my sons and a couple friends. Should we register now or the day of? Each person playing in the tournament needs to have their own account. Be sure to bring printed copies of your profile pages or be able to bring up the accounts on your phone so we can verify y'all! We're on our way to the site! See y'all there! Thanks to everyone for coming out today! I hope y'all had fun at this one! 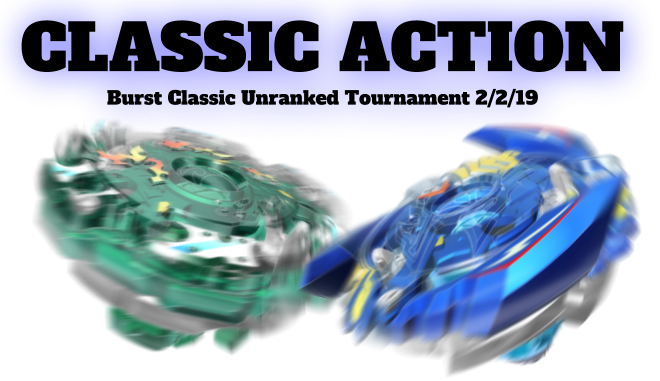 Our next tournament will happen sometime around March or April, and it'll be the standard Burst format. I should have spreadsheets and brackets up soon! It was an epic tournament! I had lots of fun. My dark valtrek and I rode to the top but we lost in the finals. Can't wait to see more classic data!